Without knowing how many miles they are looking to walk, and not knowing how physically fit they are, it's just hard to make a good recommendation. But, in my opinion the very best overnight backpacking trip in our region is from Carver's Gap to 19E. It's about 14.5 miles with tons of views, campsites, and water sources. If that is too many miles for them or too tough, then another option would be still to start at Carver's Gap and go north, but once at Yellow Mtn Gap you could go down the Overmountain Victory Trail. This would cut off about 5 miles and would be a lot less strenuous (all downhill). Another option would be in the Grayson Highlands (Southwest Virginia) (more park information here), 12 miles and simply a wonderful one-night backpack! Click here for description and details of the hike. Click here for an 8 mile option from Elk Garden to Massie Gap in the Grayson Highlands. Another one that I loved in the Grayson Highlands gives you the chance to summit Mount Rogers (Virginia's highest peak). It's only 11.3 miles and is one that I took some beginners on for their first backpacking experience. Click here for more information. The hike from Carver's Gap to Yellow Mountain Gap along the AT - you can stay at the "barn" at the gap, or push on to any of a number of great camping spots near Little Hump or Hump Mountain. If you have another one night backpacking trip in our area that you’d like to recommend, please let us know! 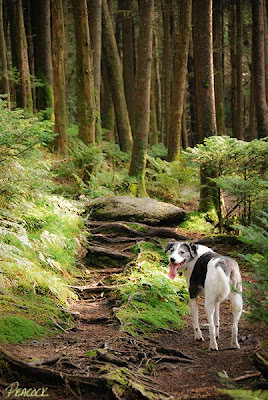 Above: Duke stops for a breather along a section of the Appalachian Trail on Roan Mountain (8/08). Wow, a whole post! We are definitely going to check these out. The photo is the perfect accompaniment to the question I sent AND the perfect motivator--our dog Agee LOVES to hike with us, and the dog in this shot sure looks happy. Thank you!! hi - i just stumbled upon your blog and it's stunning! and it reminds me that if i end up back in the appalachains after i finish my phd it won't be the end of the world. (i was born and raised in blacksburg (in fact my cat max is named max-the-new river) and have lived west since getting my masters at u of ga since 1998). i've never really felt this way in all these years, but your blog really reminds me of all that i love about those mountains. thank you. 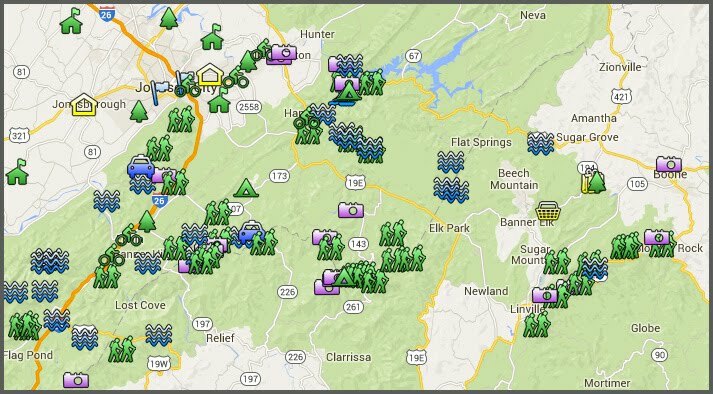 I found your blog by searching for NC mountains blogs - yours is great! I especially love the winter shots from last November, I lived in Alaska last year and I will be searching for snow to photograph this year. Thanks for the inspiration, I will be reading more!